The Giant Pumpkin Festival has been happening for the past 6 years and keeps increasing in popularity. The 2019 festival will take place on 8 – 9 March 2019 in Heidelberg, Western Cape at the Heidelberg Show grounds, just 275 km from Cape Town. 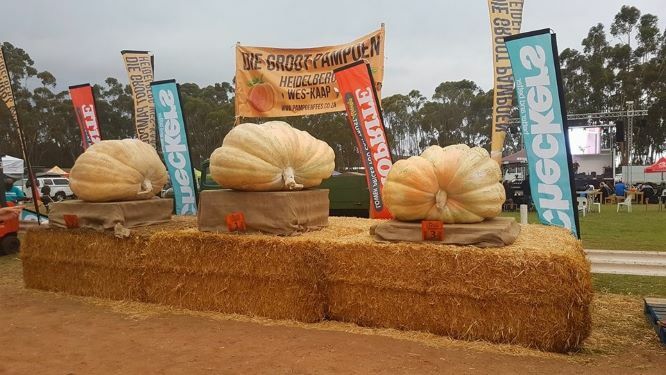 The Giant Pumpkin Festival is set to become a popular calendar event in the Hessequa region. In 2016 a Mountain Bike Race was added and because of it’s success since then – we are repeating this in 2019 – Bigger and Better! The festival will celebrate, as usual, the Largest Pumpkins in South Africa and also host a Golf Day, Running Race and Live Music and dance. During the day there will be events for kids such as, Pumpkin Tug of War, Jumping Castle, Putt Putt and more. A Campsite will be available at the show grounds and local accommodation options will be promoted.